The American Hungarian Federation (AHF) sends you its best wishes and success in leading our Nation and improving American-Hungarian relations. In that regard, we appreciate this opportunity to urge your Administration to adopt a new approach to our bilateral relations with Hungary. 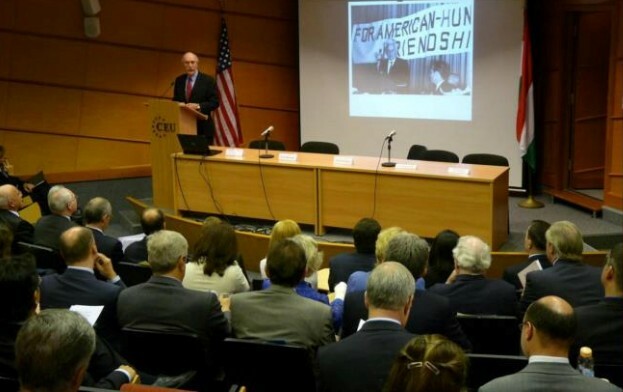 Founded in 1906, AHF is the oldest Hungarian-American umbrella organization whose mission includes fostering good relations between the United States and Hungary. Previous administrations have misunderstood the people and politics of the countries of Central and Eastern Europe (CEE) in general and Hungary in particular. 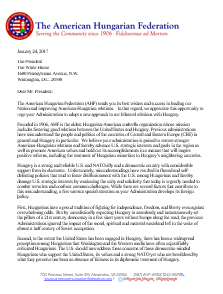 We believe your administration is poised to restore stronger American-Hungarian relations and thereby advance U.S. strategic interests and goals in the region as well as promote American values and hold out its accomplishments in a manner that will inspire positive reforms, including the treatment of Hungarian minorities in Hungary’s neighboring countries. Hungary is a strong and reliable U.S. and NATO ally and a democratic country with considerable support from its electorate. Unfortunately, misunderstandings have resulted in flawed and self-defeating policies that tend to foster disillusionment with the U.S. among Hungarians and thereby damage U.S. strategic interests by weakening the unity and solidarity that today is urgently needed to combat terrorists and confront common challenges. While there are several factors that contribute to this misunderstanding, a few warrant special attention as your Administration develops its foreign policy. First, Hungarians have a proud tradition of fighting for independence, freedom, and liberty even against overwhelming odds [1944, 1848, 1956]. But by unrealistically expecting Hungary to seamlessly and instantaneously set the pillars of a 21st century democracy in a few short years without bumps along the road, the previous Administrations ignored the impact of the moral, spiritual and material wasteland left in the wake of almost a half century of Soviet occupation. Second, to the extent the United States has been engaged in Hungary, there has been a widespread perception among Hungarians that Washington and the Western media have often unjustifiably criticized Hungarians. The U.S. should now address these concerns of those democratic-minded Hungarians who support the United States, its values and a strong NATO yet who are bewildered by what they perceive has been an absence of fairness in its diplomatic treatment of Hungary. There is a chance, however, that if the U.S. fails to dispel the perception of unfairness, these disappointed long-time friends of America may adopt more cynical anti-Western attitudes and thus weaken the alliance contrary to U.S. geo-strategic interests. Third, there has been a tendency by U.S. officials to repeatedly and publicly criticize and lecture Hungarians in a patronizing and humiliating manner. The lectures even extend to questions that are truly internal matters, such as the debates among Hungarians regarding their history. The impact of this unproductive and undiplomatic approach on Hungary and its current political environment must, we respectfully submit, be taken into consideration if the United States is to fine-tune and develop sound and effective relations with Hungary. Promoting an understanding of American values and its accomplishments without blatantly interfering in Hungary’s internal matters would advance U.S. interests and policy goals in the region and reestablish strong bilateral ties, thereby strengthening NATO and inspiring positive reforms in the region. Thank you for considering our views, and we look forward to working with your Administration to advance U.S. interests in CEE and Hungary. We would appreciate meeting with your advisers at their earliest convenience to discuss these important matters. 1/20/2015 - Politics.hu publishes Op-Ed by AHF President, Frank Koszorus, "What is the endgame for U.S.-Hungarian relations? "In a Tweet on January 12, 2015, US Embassy Charge d’Affaires Andre Goodfriend quoted Stephen I, the first king of Hungary (975–1038), who urged his son Emeric to welcome foreigners.The Tweet...clearly made in response to the Hungarian Prime Minister's recent policy statement... that Hungary and Europe should, with the exception of political asylum, curb economic immigration.